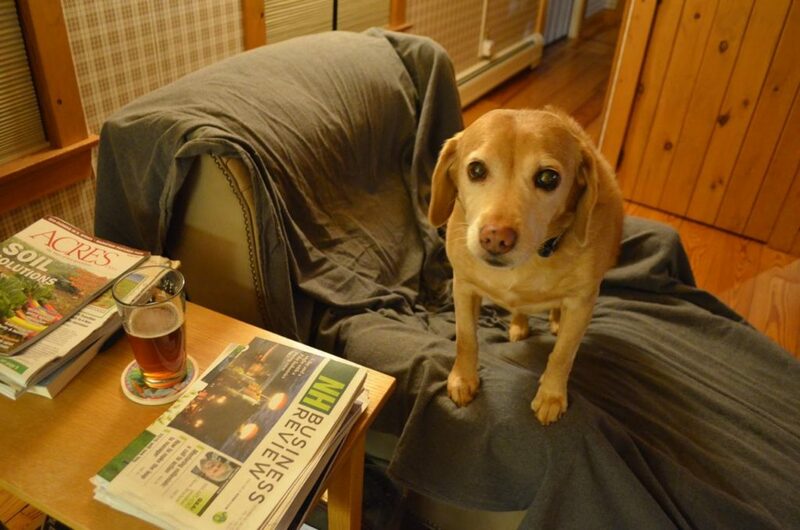 I took that photo Friday evening when Darla was imploring me to let her have a taste of my after-dinner beer. That face is almost impossible to resist, but resist I did. Following dinner the previous night, I had gone over to my chair in the corner, set the glass of beer on the end table, and headed down the hall to check on the wood stove in the dog wing. While I was gone, Alayne just happened to look over from the kitchen and saw Darla standing up on the arm of her chair, looming over the glass and about to stick her tongue in it (and, no doubt, knock the glass over). Alayne yelled and Darla pulled back just at the last instant. Upon my return to the living room, I learned just how close I had come to losing my beer. 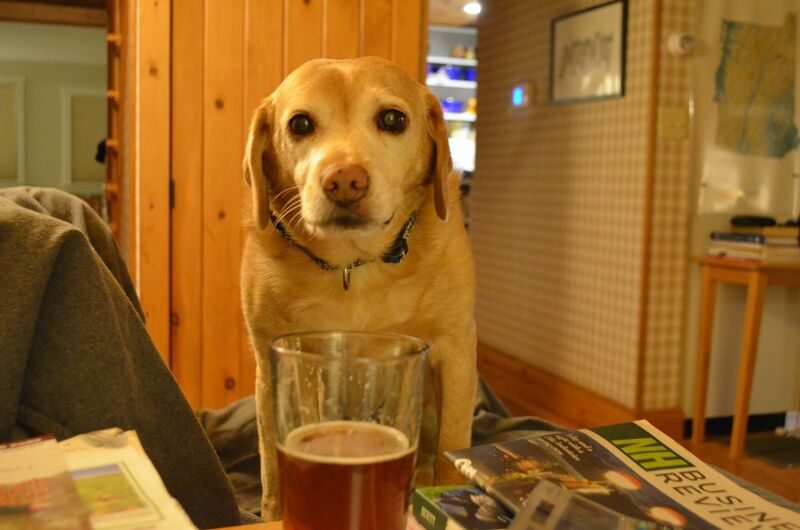 Now, this is not the first time Darla has shown interest in my Long Trail Ale from Vermont. But I’ve never seen her actually try to sneak a drink on her own. So on Friday night I was ready with the camera. I was waiting to see how far she’d go with me sitting there watching her. Of course, at the very moment that Darla?actually reached forward and tried to stick?her tongue in the glass again, I was fiddling with the camera and missed the shot! I was surprised she’d be that bold, but there she was. The look you see in that photo above is also the same look I get when I am paying attention to anything other than her. If I’m reading in the chair next to her, she will often get up like that and stare at me, so I am compelled to put reading material down and make over her. Or if I’m on the floor and working on the wood stove, I get nudged in the back by a pink nose and turn around to see that face. The stove must wait. Or, heaven forbid, if I’m petting another dog like Tanner. I get “the stare,” I melt, and that’s it. This is why she thought that looking at me this way would score her the beer she coveted. It almost always works. At least now I know: Never leave the beer unattended! She is precious! She is maybe drawn to the earthy smell of the beer? She probably just wants to see what she’s missing. My dogs don’t try to get into anything I am drinking, but one of my cats is terrible about it – he likes to put his paw in my drink – be it coffee or water or whatever. Yuck!! I can’t leave anything unattended! You may as well admit defeat, Steve. We’ve all seen how low your resistance to Darla’s wishes is. It’s time to order a beer stein with her name inscribed on it, and share. Maybe your favorite brewery makes a Long *Tail* Ale just for Darla. Really, on a nice, cozy fall night the two of you couldn’t kick back and have a toddy together and talk about the day? Well, who knew Darla was such a party girl. She’s got you wrapped around her paw!!! You a strong man resisting the plea for beer. This is hilarious! I have a Springer who stuck her tongue down into a wine glass one time and got a few good licks. But it was a Cabernet… she said she prefers a fruity white, LOL. Thanks for the laugh, and the adorable pictures of Darla. When our last German Shorthair was a pup, he knew not to steal food from the dining table, but no one mentioned the bedside table. One night, that’s where I set down a short glass of cr?me de cacao and milk. Left the room briefly and returned to find Mr. Pig (yeah, he earned his name fair and square), standing on the bed (where he was permitted), leaned over the bedside table, lapping up my drink. Oh my, did he sleep well that night! From then on, if I was mixing a drink, he homed in on me with a similar begging/imploring look. Who could resist that face? I don’t doubt it makes your heart melt. A beer drinker myself, I can imagine your concern..!! I had a best friend named Brandon for 12.5 yrs. and had to watch him every minute,….He LOVED my Guinness.!!!!!!! a check and some more beds coming,..hopefully soon. I had friends who would give their horses a lick of beer from their hand. That makes sense, since beer is made out of grain. I never imagined a dog would like beer. Now we know!